We have two of these striking white, black and orange Giants, both mediums (52.5cm seat tube, 54.5cm top tube, 80.3cm standover). These bikes have aluminium frames with carbon composite forks, SRAM’s Force 10 speed drivetrain and hydraulic disc brakes. They also feature the Giant P-CXR1 Wheels and a 15mm thu-axle front hub/fork. We have three of these bikes in grey, white and green Specialized ‘Cross bikes. The sizes are 52, 54 and 56cm (top tube lengths are 53.6, 54.9 and 56.0 cm respectively). These bikes have aluminium frames and FACT carbon disc forks with tapered steerers. In addition, there are SRAM hydraulic discs, SRAM 10 speed drivechain, including Apex derailleurs and AXIS 2.0 wheels. Another striking bike, in white with black/tan detail, we have two available in Large and XS (49 and 58cm, with top tubes of 51.7 and 54.4cm repectively). Aluminium frames are allied to carbonforks with alloy steerers. Levers and majority of the Drivechain are Shimano 105 10-speed (mechanical disc brakes). 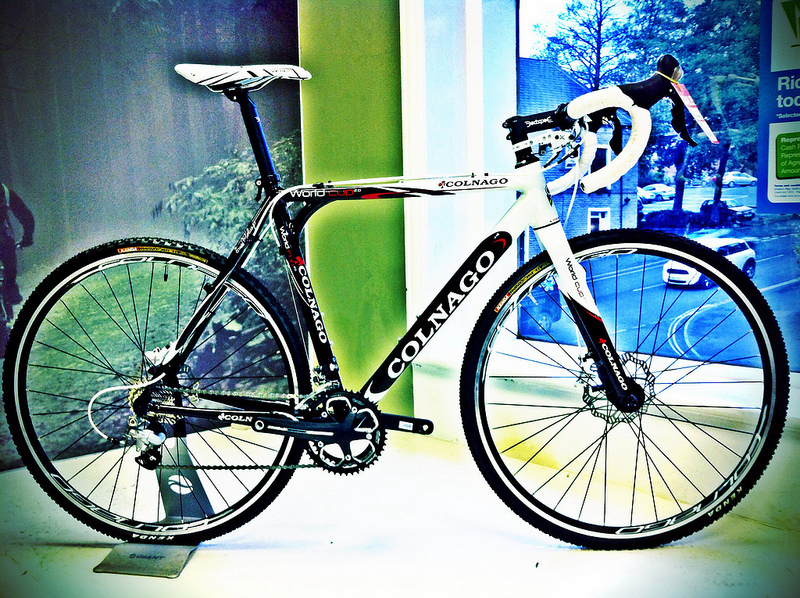 White bikes are certainly in at the moment and this Colnago is another cracking looking bike. We have just the one of these high spec bikes. It features an Aluminium Frame (size 55cm), Carbon fork, Ultegra 10 Speed, TRP Parabox Hydraulic discs (via converter) and lots of classy Colnago finishing kit. Schwalbe Landcruiser Tyres (£16.99). The “go-to” tyre for a generation of 3-Peaks riders, this tyre’s fast-rolling centre ridge, grippy side knobbles and heavy-duty sidewalls combine to provide adequate traction on the fells, decent rolling on the roads (nearly 20 miles of the event are on tarmac) and some measure of pinch puncture resistance. We also have a range of other tyres and can provide additional customisation on gearing and other technical upgrades to make your bike work for you.